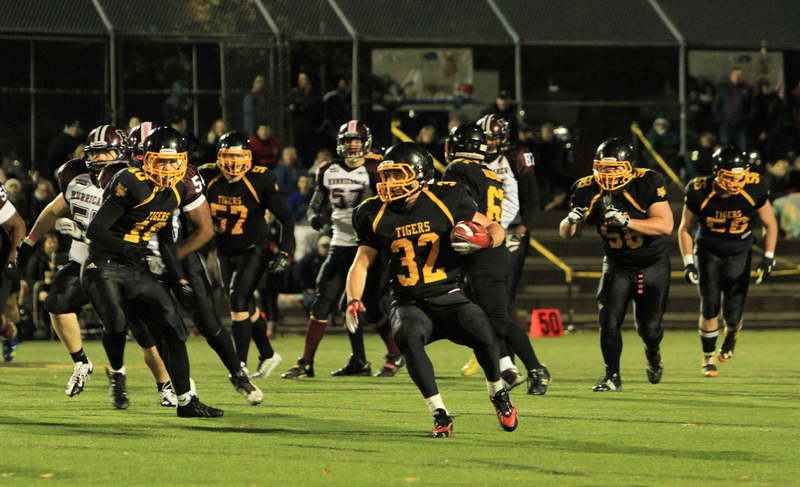 It took less than 15 seconds for the Dal Tigers football club to look like it was not going to be their night. The opening kickoff resulted in a Dal fumble and a Holland College touchdown. Down early to a team that finished the season with a considerably worse record, it was clear the Tigers were inside their own heads. Despite playing well last week and getting the starting nod in the semi-finals game, quarterback Matt Shannon looked completely confused. Before getting replaced in the second quarter, Shannon constantly tried to take too much, throwing long bombs down the line to targets that simply were not there. This resulted in two interceptions on nearly identical passes where Holland College defensive back Jay Dearborn came over the top and easily took possession back for the Hurricanes. These were painful mistakes by a young QB who obviously was not comfortable playing from behind in this situation. The game did start to form better for the Tigers when Nick Hunsley came into the game at QB. Hunsley was much more comfortable taking what the Hurricanes defense would give him, which frequently resulted in short underneath routes. As the game went on, he showed an increasingly better skill at hitting the receiver in stride and helping his team gain yards after the catch. Even though the Tigers had played some mediocre football in the first half, a lucky fumble return for a touchdown kept them within a score just a few minutes into the third quarter. The Tigers defense stepped up and shut down the Hurricanes attack, despite getting beaten deep along the lines on several occasions. The game rested on the Tigers offence, which never found its stride. For most of the second half, the Tigers offence looked stagnant. It seemed as though the team had mapped their offence around Shannon, which heavily focused running the ball on first down in an attempt to relieve some of the pressure from the youngster. However, the Hurricanes defense constantly stuffed the run and made for second-and-long on almost every possession for the Tigers. The Tigers offence started to click, about halfway through the fourth, once the play action bootleg was in full effect. This suited Hunsley’s ability to throw on the run, allowing the undersized quarterback to scramble outside the pocket and extend the play with his arm. The early Hurricanes lead, however, would prove insurmountable. This was easily the most talented team the Dal football club has fielded since its inception, but it seemed the team didn’t have the right mentality on several levels to win a playoff game. This team could have been champions this year, but a lack of heart and some questionable offensive strategy led to another year of empty promises. Justin was an Online Editor for Volume 146 of the Gazette.